"If I ever did marry, it would be to someone super and loveable like... you! We can't marry because we're cousins. 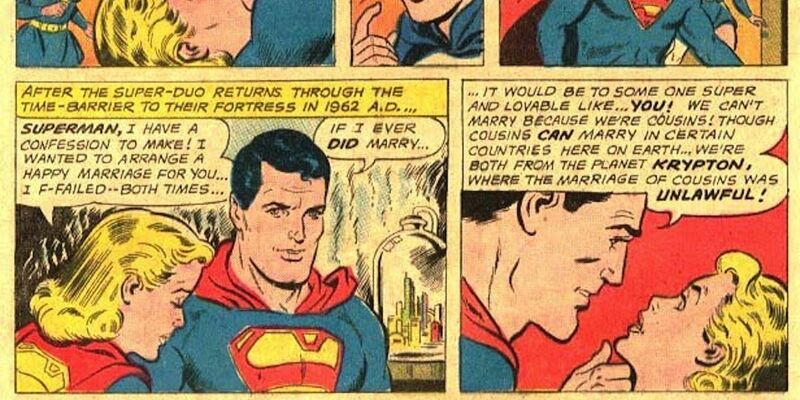 Though cousins can marry in certain countries here on Earth, we're both from the planet Krypton, where the marriage of cousins was unlawful!" You'd think his Kansas upbringing would be more of a sticking point for Supe than the law of his dead planet, but it's a lot more troubling that he's pretty much fine with Supergirl's third choice - basically Supergirl herself, about ten years older. It's true that a lot of men seek out women who remind them of their mothers, but this is still as creepy as Silver Age superhero comics got. Even Larry Niven's "Man of Steel, Woman of Kleenex" said on this general topic, "She can't mate with Superman because she's his first cousin. And only a cad would suggest differently."